Star Wars: Interregnum is an upcoming mod for Sins of a Solar Empire: Rebellion that builds off of the highly successful Enhanced 4X Mod. Fleeing the unknown terror that is chasing the Vasari, the factions of Sins of a Solar Empire stumble on a temporary wormhole that takes them to a galaxy far, far away. The sudden arrival of armadas with trillions of refugees and thousands of warships between the events of Episodes 5 & 6 forever alters the Star Wars universe and plunges the galaxy into an unprecedented period of chaos and violence. Begun, a new conflict has. Nice job this is a worthy intro for such a great mod. This is fantastic! I cannot wait till its included in the mod! This is amazingly awesome! I am going to reread all the lore posts to celebrate! 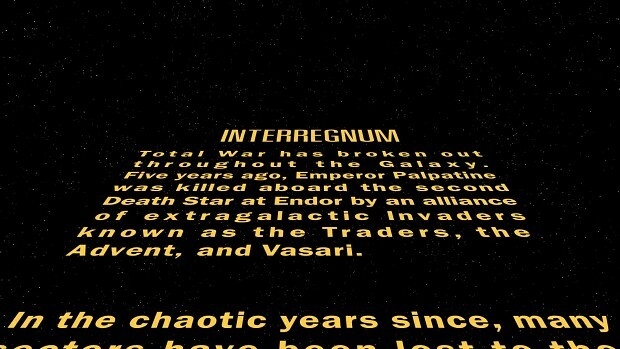 idk that seems more flowing than "that a skilled commander"
Thanks to the awesome BouncyTEM, Interregnum now has a Star Wars opening crawl. This will replace the standard Rebellion intro in the next update.